The 2014-15 season will go down as one of the most successful campaigns in the ACC’s long and illustrious history. It was the kind of year that commissioner John Swofford must have envisioned when the conference completed its last round of expansion. It was also important for the league to have this kind of performance after an extremely disappointing run last season, its first as a giant 15- team group featuring some of the biggest names in the sport. Before we put a bow on the season, let’s take a quick look at how the season played out with a review of some of the highlights and lowlights. 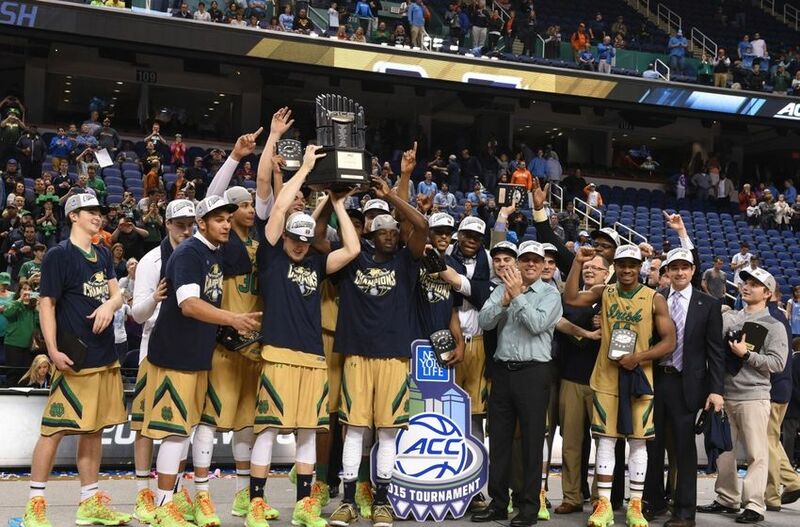 Notre Dame celebrates its first ever conference tournament championship. Jahlil Okafor, Duke. Okafor lived up his immense preseason billing and single-handedly turned a dangerous Duke team into a dominant one. Okafor was the conference’s second-leading scorer (17.6 PPG), third-leading rebounder (9.2 RPG) and top shooter by field goal percentage (66.8%). His ability to make the team a dual threat instead of the perimeter-reliant teams of yore means these Blue Devils have a very high ceiling come NCAA Tourney time. Jerian Grant, Notre Dame. The remarkable year that the Fighting Irish enjoyed can be traced to the return of Grant from a suspension related to academic improprieties. In addition to his highlight-reel dunks and numerous clutch baskets, Grant was a stat-sheet stuffer for a vastly improved Notre Dame team, logging 16.8 PPG, 6.7 APG and 1.8 SPG on the season. He also shot an outstanding 49.4 percent from the field. 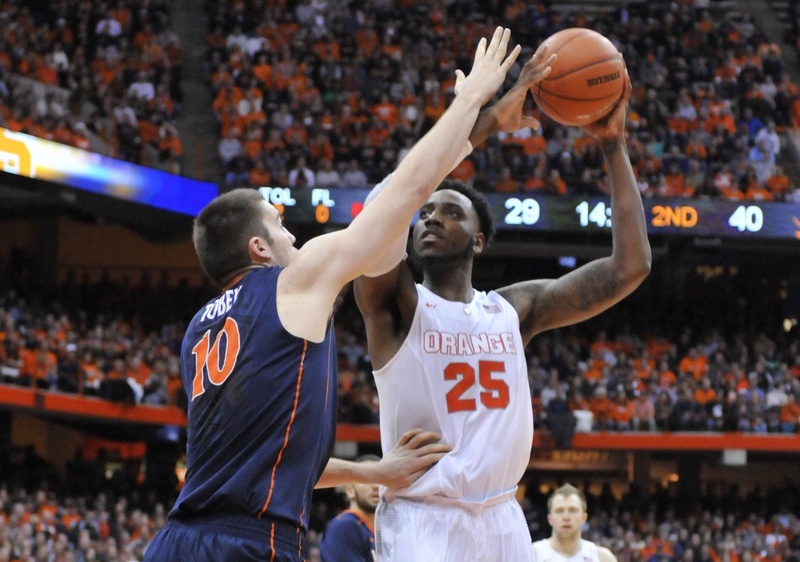 Rakeem Christmas, Syracuse. The Orange ultimately had little to play for because of their self-imposed postseason ban, but they may have produced the best on-court individual success story of the year. Christmas’ amazing improvement from his junior to senior season (17.5 PPG, +11.7; 9.1 RPG, +4.0) proved he could flourish as the team’s primary option. 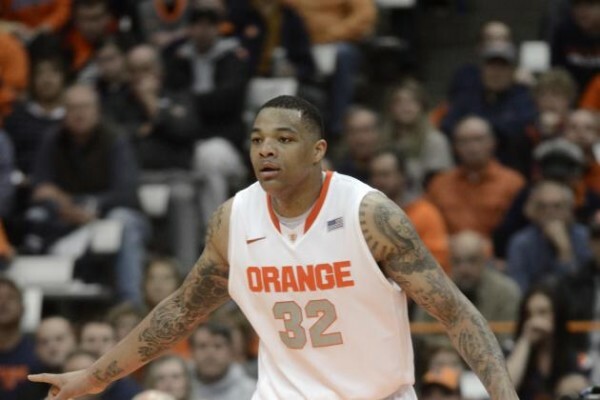 He served as the lone bright spot in an otherwise disastrous season for Syracuse hoops and has positioned himself for a bright future in the professional ranks. Malcolm Brogdon, Virginia. Brogdon’s inclusion on this list speaks to his ability to play whatever role Tony Bennett asks of him. With Justin Anderson stealing the early headlines, Brogdon was content to act as the team’s best on-ball defender and late game shot-maker. When Anderson fell to injury, Brogdon resumed his role as a primary offensive weapon. He averaged nearly 14 points per game while shooting 34 percent from three and 86 percent from the line. Traditional statistics never do Virginia players much justice, though, but Brogdon’s intangible ability to meet the demands made of him showed his true value to the ACC regular season champs. Olivier Hanlan, Boston College. Hanlan played on a mediocre Boston College team but his offensive prowess was rivaled by none in this year’s ACC. The conference’s leading scorer at 19.4 points per game, he remained a deadly offensive weapon despite playing the point guard position for the first time in his career. He scored 30 or more points four times, including a stellar 39 points on just 20 shots against Pittsburgh. Duke Chronicle: No doubt you’ve already heard but Duke‘s student newspaper dropped a bomb on the college basketball world with this article on Rasheed Sulaimon’s alleged involvement in two sexual assaults. First, this is tremendous reporting even thought it relies heavily on unnamed sources. Next, I don’t want to comment too much but this isn’t a good look for Duke. Don’t expect much clarification from the university or Coach K in coming weeks, but I do think a more detailed timeline will come out. Sulaimon is still enrolled at Duke, which makes me think we’ll get more information soon. My gut reaction is that the Duke athletic department really dropped the ball with this even if its administrators and staff didn’t do anything illegal. Syracuse Post-Standard: Great story from Donna Ditota on Rakeem Christmas, aptly nicknamed “the mayor of Syracuse” by teammate BJ Johnson. Christmas is a prime example of why it pays to return to school (well other than the untimely postseason ban). He went from the fourth, maybe fifth, option in the lineup to the go-to guy. He’s improved all of his per game stats without a huge drop in efficiency (and that doesn’t factor in all of the double-teams), and he’s one of the few seniors who has really improved his draft stock this year. Here’s to hoping his advanced age doesn’t scare away NBA teams. 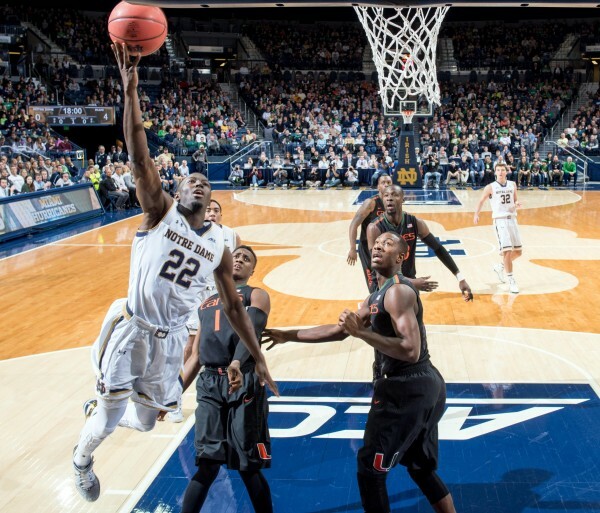 NBA Draft Blog: Speaking of seniors who have improved their draft stock, Ed Isaacson took a look at Jerian Grant‘s draft prospects after he graduates from Notre Dame. Grant also has the dreaded age problem, but he has played more man-to-man than Christmas and feels like a sneaky good pick late in the first round. He’s far from a sure thing at the next level, but he’s more athletic than people give him credit for and is a pure scorer. He’s been one of the most well-rounded offensive players in the country this season, and I think he would excel by coming off the bench for a good NBA team. CBSSports.com: The NCAA is looking to deflect blame in some of its most recent dealings with former student-athletes. This time it relates to Rashanda McCants (Rashad McCants’ sister) and former North Carolina football player Devon Ramsay, who are suing North Carolina and the NCAA. From an outsider’s perspective, this case involving theories of liability on academic fraud looks like a long shot, but strangely enough the NCAA’s APR rules could make it more responsible for its member schools’ academic curricula rather than less. A good metaphor is that of McDonald’s, a company with very strict guidelines for franchisees that led the National Labor Relations Board (NLRB) to label the company as a “joint employer” instead of a true franchise. You may recognize the NLRB from a 2014 story on Northwestern football players unionizing (something that obviously hasn’t yet come to fruition), but all of these cases may combine to slowly turn the tide of public opinion and ultimately break the NCAA’s back. Tar Heel Depot: Very cool idea for a running series. Bryan Ives reminds us all of Georgia Tech‘s Ishma’il Muhammad with an epic highlight video set to Ghostface. This is what blogging is all about. EXTRA (via Fought and Won One): Starting to piece together your all-ACC teams as the season comes to a close but want to be able to sort by all the different stats? Austin Johnson has you covered. Walker Carey (@walkerRcarey) is an RTC Correspondent. 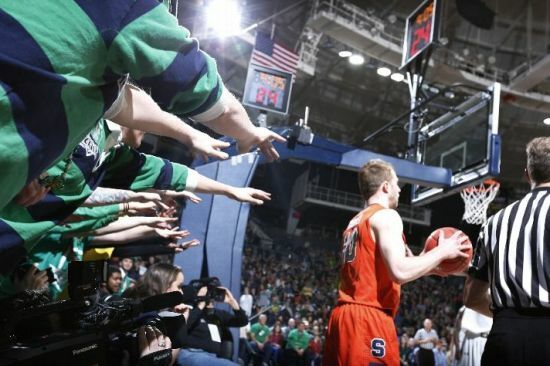 He filed this report after Tuesday night’s game between Syracuse and Notre Dame in South Bend. Syracuse may no longer reside in the Big East, but that didn’t stop bloggers from an old rival from putting their spin on yesterday’s news that the Orange had imposed a postseason ban on itself this season. Casual Hoya, the occasionally irreverent but always on-point voice of Georgetown fans, had this to say about the news from upstate New York. In other words, Syracuse will not be accepting an invite to this season's NIT. The jab is certainly worth a chuckle, but it should also be good for a firm nod or two. Even as Jim Boeheim’s team currently sits at 15-7 (6-3 in the ACC), the NIT appeared to be a likely destination for the Orange if they had remained postseason-eligible. Their respectable record partially obscures that unpleasant reality, but it shouldn’t be enough to shield Boeheim’s brain trust from a bit of second-guessing on the timing of the announcement. Declining an NIT bid is hardly a sacrifice – heck, ask the Hoyas about that themselves – but Syracuse must be hoping that it will appear as if it is giving up a potential spot in the NCAA Tournament. To be fair, there definitely was enough time and opportunity for Syracuse to play its way into the field of 68; more likely, however, is that February 3 goes down as the high point of an otherwise uninspiring season, rendering the ban meaningless. Sporting News: Even before Duke manufactured an impressive comeback for Mike Krzyzewski‘s 1,000th win on Sunday, Mike DeCourcy made the case that Coach K is the best coach ever in college basketball. Specifically, DeCourcy makes the case for the ACC legend over John Wooden and his 10 national titles. The problem is (and this is part of his argument) that the game is simply incomparable now to that of UCLA’s heyday. Truthfully, it’s totally different than it was even 15 years ago. And that’s the best argument in favor of Coach K (if you’re one to compare apples and oranges), as he’s succeeded over a huge range of time. He’s easily the most accomplished coach of the modern era, but I’m not ready to sharpie him in over the likes of Bob Knight, Dean Smith or John Wooden in the history books. Each ruled an era and changed the game in their own images. That’s good enough for me. Syracuse Post-Standard: Jim Boeheim got a little salty (and rightfully so) that big man Rakeem Christmas was left off the Wooden Award watch list, calling him “probably the best center in the country.” That’s a pretty bold statement with Duke’s Jahlil Okafor playing in the same conference, but it’s true Christmas hasn’t been getting the national credit he deserves for putting up nearly identical numbers to Okafor (marginally fewer points and a little lower percentages, but better defense). Christmas is averaging 18/9 on 60 percent shooting this season, nearly doubling his usage without seeing much of a hit in his efficiency (although his block percentage is down). Here’s to hoping ACC voters give Christmas his due come all-ACC voting season. Soaring to Glory: So this article is both weirdly pessimistic and optimistic. About Boston College’s current players, it’s very pessimistic. That’s fair considering last season’s dumpster fire, but there’s more talent on this year’s team than say… Virginia Tech. But the roster is pretty thin thanks to Steve Donahue signing no one of consequence and a couple of transfers out of the program. But it’s at least tentatively optimistic on the prospects of first-year head coach, Jim Christian. This year’s group is playing with more heart than last year’s squad, but it’s hard to say how much of that comes from the top and how much comes from the change in player personnel. I think the Eagles are likely better off in the long run with Christian, but until we see what sorts of players he’ll bring to Chestnut Hill, it’s tough to get overly optimistic. In addition to offensive Xs and Os, Donahue excelled at finding “diamonds in the rough” (like Olivier Hanlan); he just couldn’t fill out an ACC-quality roster. Christian isn’t the type of guy who will be in the running for many four-star players, so he’s got to have good evaluation skills to succeed there. Tallahassee Democrat: Florida State’s Xavier Rathan-Mayes is starting to live up to his high school scouting report and fill up the scoring column. He’s still not a good shooter from long range, but he’s averaging 18.5 points a game in ACC play and was lethal against North Carolina over the weekend. Rathan-Mayes is apparently very open to coaching, which is good because he’s also prone to heat checks. You get the feeling that he’s got a chance to be a very special player in Tallahassee if he keeps on this trajectory. Fayetteville Observer: North Carolina is starting to pile up injuries on the wings that could make running challenging. Theo Pinson broke a bone in his foot, so he’s now sidelined along with Joel Berry and Stilman White. The good news for Tar Heels faithful is that the injury bug has mostly avoided the starters (although Marcus Paige is a little banged up). The bad news is that Berry and Pinson need the playing time to improve (and to give Roy Williams the rotation he likes). Some of the ACC’s squads righted the ship in a relatively quiet week, while still others affirmed their descent to the cellar of the conference standings. With six weeks remaining in the regular season, there is still plenty of time for teams to ascend or plummet, and we’ll continue to track their progress on a week-to-week basis. Below is this week’s ACC Stock Watch. North Carolina. While the Tar Heels’ win over Virginia Tech was less than enthralling, their more impressive road win over a Wake Forest team that was competitive with both Duke and Louisville at home lends credence to the notion that they may be hitting their stride. However, mounting injuries in the backcourt are a concern for Roy Williams. Duke. After the entire college basketball nation wondered what was wrong with the Blue Devils with consecutive losses to NC State and Miami, Duke responded with an impressive road win over Louisville and an easy dismantling of Pittsburgh on Monday night. Coach K may have found some defensive relief with the zone he’s employed much more heavily in the past two contests. 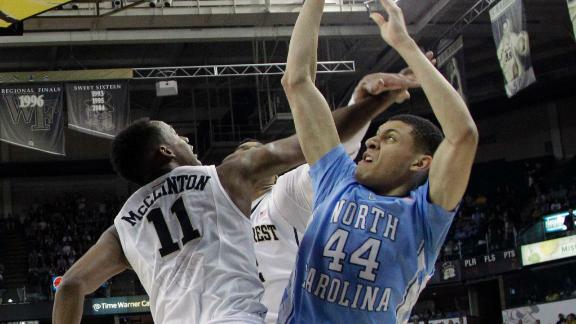 Justin Jackson, North Carolina. Jackson’s emergence over the last week has finally given everyone a glimpse into the player he can become: an efficient offensive threat to complement Marcus Paige on the perimeter. In wins over Virginia Tech and Wake Forest this week, he scored 33 points on a combined 11-of-18 shooting (3-of-6 from three). Tyus Jones, Duke. The Blue Devils’ freshman point guard endured a rough initiation to ACC play but rebounded with two strong efforts this week. His 10-point, eight-assist performance in a hostile environment at Louisville was steady and important, but he really broke out with a 22-point effort against Pittsburgh, including four three-pointers. Jones made his recent freshman jitters appear to be just that, rebounding individually very nicely along with his team. Rakeem Christmas, Syracuse. His week began by being named ACC Player of the Week on January 19 and ended with a demonstration on just how important he is to this Syracuse team. Riddled with foul trouble and available for only 23 minutes, the Orange’s big man still contributed 12 points and seven boards against Boston College. His absence made it possible for the Eagles to hang around in that game, showing once again that Jim Boeheim doesn’t have many options outside of his star center. Clemson. Holding serve against Syracuse at home was nice, but losing to Florida State was something the Tigers couldn’t afford. Clemson still appears to be a team trending towards the bottom of the standings as its inconsistent offense remains a major issue. Syracuse. 5-1 in the ACC and not trending up? Get back to me when the Orange actually beat a good team. While it was nice that Jim Boeheim’s team held on against Boston College with Rakeem Christmas barely on the floor (see above), this team had better improve dramatically before it enters the final phase of a lopsided schedule (its final seven games include Duke twice, Louisville, Virginia, and Notre Dame). Having one of the least productive benches in the country doesn’t bode well for the Orange’s NCAA Tourney chances. Louisville. Perhaps the loss to Duke wasn’t unexpected with the Blue Devils coming off of consecutive defeats, but the Cardinals’ continued offensive struggles is a major concern. They’re still only shooting 42.7 percent as a team, and Rick Pitino can’t seem to find consistent shot-making from Chris Jones or Wayne Blackshear. Their admittedly outstanding defense can only carry them so far in a conference this loaded with offensive talent. Virginia Tech. The Hokies’ 8-10 overall record and 0-5 ACC start aren’t a surprise, but with the recent announcement that leading rebounder Joey Van Zegeren is leaving the team, their outlook for the remainder of the season became even more bleak. The notion was that Buzz Williams could perhaps coax some surprises out of this roster, but that doesn’t appear to be the case. Georgia Tech. Now 0-6 in the ACC. And yes, Virginia is a great team, but scoring a mere 28 points for an entire game (12 in the second half)? Brian Gregory’s team may not be able to recover from such an awful start to the conference season. The Yellow Jackets are at or near the bottom in the ACC in both scoring and stopping their opponents from doing so. That translates to 0-6. Montrezl Harrell, Louisville. As we noted last week, it’s not just that his shots and productivity are down; but now the junior has been stripped of his captaincy by Rick Pitino (later clarified, to some extent, by Pitino on his radio show). Even if this maneuver was a mutual decision or some kind of motivational ploy, it’s not a good sign for the Cardinals if their star needs to tone down his act. Coupled with his earlier suspension for throwing an elbow, Harrell is on the precipice of becoming a bit of a malcontent to the detriment of his team’s success. In the headline match-up of the weekend, Duke ended its two-game losing streak with a surprisingly comfortable win at Louisville on Saturday. But the bigger surprise was how the Blue Devils did it, going almost exclusively with a 2-3 zone defense that was incredibly effective against the cold-shooting Cardinals. Notre Dame rallied from a 12-point second half deficit to beat Miami in South Bend on Saturday, keeping the Irish in second place in the league standings behind undefeated Virginia. The Cavaliers also had to mount a second half comeback to overtake Boston College Saturday afternoon in Conte Forum. In other games over the weekend, Syracuse dropped its first league game of the year at Clemson; N.C. State picked up a road win versus Florida State; and North Carolina and Pittsburgh each won home games against a pair of conference winless clubs, Virginia Tech and Georgia Tech. Here are some other highlights from over the weekend in the ACC. Most Outstanding Player: Jerian Grant had scored a total of only 26 points in his previous three games, but the senior guard broke out of his mini-slump with a huge effort against Miami on Saturday. The ACC Player of the Year candidate finished with an efficient 25 points that came on 8-of-10 field goal shooting. He also passed out eight assists and was part of a perimeter defense that held Hurricanes’ guard Angel Rodriguez in check. Rodriguez had torched Duke in his previous game with 24 points, but only managed four points on 1-of-10 shooting Saturday. Grant was also the difference down the stretch as his three broke a tie with 6:19 left and he also scored a layup and blocked a shot in the last minute to seal the win. Best Win: After looking nothing like a championship contender in its two prior outings, Duke got back on track with a mild upset at Louisville’s KFC Yum! Center on Saturday. After an all-night coaches’ meeting following Duke’s home debacle versus Miami, Mike Krzyzewski abandoned the Blue Devils’ trademark pressure man-to-man defense to instead play a 2-3 zone against the Cardinals. While it was a big surprise to most of us, the zone was not totally unexpected by Louisville’s Rick Pitino, who said afterwards, “Duke is a team that never plays zone… and that’s what I would have done if I were in [Mike Krzyzewski’s] shoes.” Pitino is no doubt referring to his team’s lack of perimeter shooting, which finished a chilly 4-of-25 on three-pointers against the Devils. Ironically, Duke looked a lot more like a recent-vintage Syracuse team, with the Blue Devils playing deliberately on the offensive end to go along with the newly-installed zone defense.